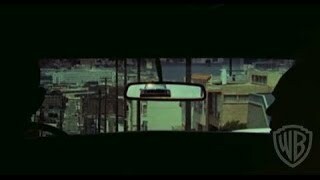 "Steve McQueen was cool, tight-lipped and could maneuver his wheels in a hilly car chase..."
"Yates' sleek cop thriller stands up well....The film makes excellent use of its location settings." In one of his most memorable roles, Steve McQueen stars as Detective Frank Bullitt, a hard-driving, tough-as-nails San Francisco cop. Bullitt has just received what sounds like a routine assignment: keep a star witness out of sight and out of danger for 48 hours, then deliver him to the courtroom on Monday morning. But before the night is out, the witness will lie dying of shotgun wounds, and Bullitt, a no-glitter, all-guts cop, won't rest until he nabs the gunmen and the elusive underworld kingpin who hired them. From opening shot to closing shootout, Peter Yates's edge-of-the seat thriller is packed with authentic touches, from on-location San Francisco filming and believably crisp dialogue to uncompromisingly detailed police, hospital, and morgue procedures. The most memorable scene is BULLITT's celebrated car chase. 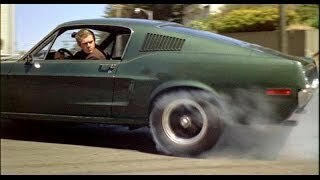 McQueen, an expert automobile and motorcycle racer, does his own stunt driving as he propels his high-performance Mustang GT around and over San Francisco's fabled hills at speeds up to 115 miles an hour. The film is based on Robert L. Pike's book, MUTE WITNESS. Bullitt is a detective who senses that something is wrong behind his assignment to guard a criminal witness. This nonstop thriller features one of the great car chases in cinematic history, along with a great hard-boiled performance by Steve McQueen. Theatrical release: October 17, 1968. Shot on location in San Francisco, California. Solar Productions (the Production Company behind the financing for BULLITT) was actor Steve McQueen's company. Robert Duvall plays a small role as a taxi driver, and Norman Fell as a police captain.